Why do we move through life the way we do? Why are we better at some activities than others? Why do some of us prefer to be alone rather than with other people—or at a party instead of reading a book? Why don’t we all function in the same way? From earliest times, attempts have been made to categorise individual attitudes and behaviour patterns in order to explain the differences between people. Jung’s model of typology is one of them. It is the basis for modern “tests” such as the Myers-Briggs Type Indicator (MBTI), used by corporations and institutions in order to classify a person’s interests, attitudes and behaviour patterns, and hence the type of work or education they might be best suited for. Jung did not develop his model of psychological types for this purpose. Rather than label people as this or that type, he sought simply to explain the differences between the ways we function and interact with our surroundings in order to promote a better understanding of human psychology in general, and one’s own way of seeing the world in particular. After extensive years research, Jung identified eight typological groups: two personality attitudes—introversion and extraversion— and four functions—thinking, sensation, intuition and feeling, each of which may operate in an introverted or extraverted way. Each of the four functions has its special area of expertise. Thinking refers to the process of cognitive thought; sensation is perception by means of the physical sense organs; feeling is the function of subjective judgment or valuation; and intuition refers to perception via the unconscious. Briefly, the sensation function establishes that something exists, thinking tells us what it means, feeling tells us what it’s worth to us, and through intuition we have a sense of what can be done with it (the possibilities). In everyday usage, the feeling function is often confused with an emotional reaction. Emotion, more properly called affect, is invariably the result of an activated complex, which is accompanied by noticeable physical symptoms. When not contaminated by a complex, feeling can in fact be quite cold. Jung’s basic model, including the relationship between the four functions, is a quaternity. The answers aren’t always clear, but the questions keep me on my toes. That is by and large why I don’t favour type tests. Type tests concretise what is inherently variable, and thereby overlook the dynamic nature of the psyche. —but it does not obviate the practical value of his model, particularly when one has run aground on the shoals of his or her own psychology. As mentioned earlier, one’s behaviour can be quite misleading in determining typology. For instance, to enjoy being with other people is characteristic of the extraverted attitude, but this does not automatically mean that a person who enjoys lots of company is an extraverted type. Naturally, one’s activities will to some extent be determined by typology, but the interpretation of those activities in terms of typology depends on the value system behind the action. Where the subject—oneself—and a personal value system are the dominant motivating factors, there is by definition an introverted type, whether at a party or alone. Similarly, when one is predominantly oriented to the object—things and other people—there is an extraverted type, whether in a crowd or on one’s own. This is what makes Jung’s system primarily a model of personality rather than of behaviour. 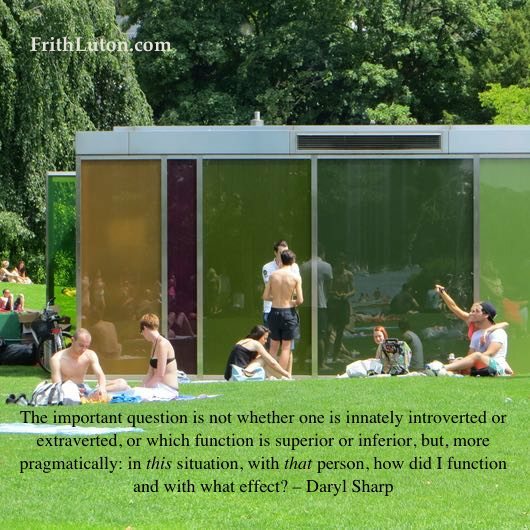 Typologically speaking, the important question is not whether one is innately introverted or extraverted, or which function is superior or inferior, but, more pragmatically: in this situation, with that person, how did I function and with what effect? Did my actions truly reflect my judgments (thinking and feeling) and perceptions (sensation and intuition)? And if not, why not? What complexes were activated in me? To what end? How and why did I mess things up? What does this say about my psychology? What can I do about it? What do I want to do about it? These are among the questions we must take to heart if we want to be psychologically conscious. 1. Note that introversion is quite different from introspection, which refers to self-examination. Although introverts may have more time or inclination for introspection than do extraverts, introverts have no monopoly on psychological awareness. 2. Carl Jung, CW 6, par. 900. Jung acknowledged that the four orienting functions do not contain everything in the conscious psyche. Will power and memory, for instance, are not included in his model, because although they may be affected by the way one functions typologically, they are not in themselves typological determinants.